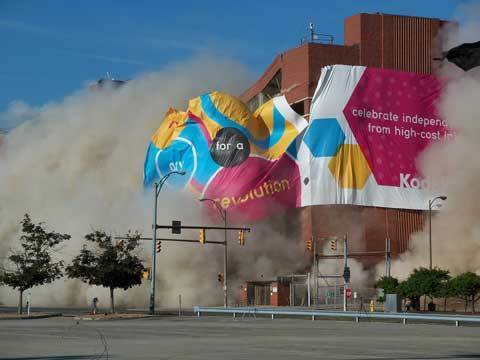 Kodak used explosives to demolish two buildings at its head office in Rochester, United States because the premises are no longer needed following the move to digital. Kodak has released a photograph of the first of the explosions which took place last weekend and was reportedly watched by up to 3,000 people. Captioning the image ?Nice Day For A Revolution?, Kodak said that the ?implosion? of its largest manufacturing site ?celebrates its technological revolution in inkjet printing?, while ?honouring the legacy of its film-based products?. The 752,000 sq ft ?Building 9?, once used to make photographic paper, was reduced to a ?pile of debris in a cloud of dust?, according to witnesses. The next day, the 487,000 sq ft ?Building 23? was destroyed. Kodak is understood to have demolished more than 80 buildings on the site over the past 10 years and plans to demolish at least 16 more by the year end. However, this is apparently the first time explosions have been used.